Rita Greig made the bears for the children in the family. They often sat in a Victorian armchair in the sitting room and this provided the inspiration for the painting. The different textures and contrasting colours are reminiscent of the paintings of Vuillard. The painting itself dates from the 1970's and will never be sold. Medium: Signed Limited edition print of 250 Image Size: 430 x 340mm. Rita Greig was born in Norwich, Norfolk and trained as a designer in London after which she taught art. She now lives in South Devon with husband and artist Donald Greig. She works mainly in oils, the paintings are usually small in size, depicting landscapes, still life and interiors as well as figures at village shows and carnivals.Awarded the Medaille D'argent, Paris Salon and is a member of the Royal West of England Academy, the New English Art Club and the Royal Institute of Oil Painters. Exhibited: Royal Academy, Galerie George, NEAC Centenary Exhibition, Patterson Fine Arts, Alpine Gallery, Mall Galleries. Paintings in public collections: The Royal West of England Permanent Collection, Chase Manhattan Bank Collection. 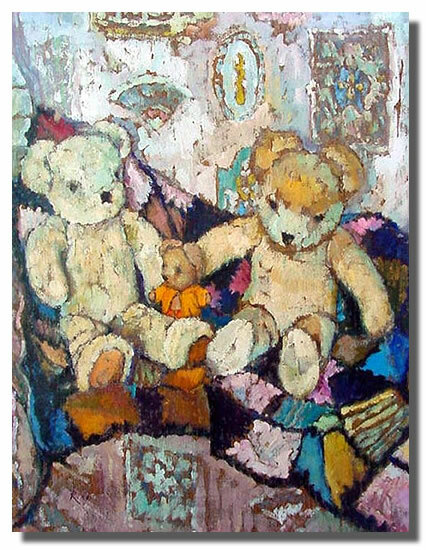 'Teddy Bears on a Victorian Armchair', fine art limited edition print by Rita Greig.